Purina introduces a new 30% Protein High Energy Cattle Tub this month for producers seeking a more convenient delivery method of protein supplements. Purina’s new 30% Protein High Energy Cattle 60 pound Tub product with controlled consumption technology provides your cattle an excellent source of protein in a convenient to handle, weather-resistant delivery method. The new 60-pound tubs from Purina supply free-choice supplements when beef cattle need more than forage in their diet for protein supplementation. The protein tubs enhance intake and utilization of available forages, reducing labor for producers. The tubs are weather resistant and able to withstand rain or wind. And because they’re easy to handle, store and manage, producers can ensure their herds receive all the nutrients necessary when forage availability changes. 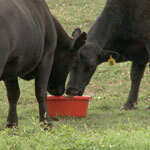 Purina’s 30% Protein High Energy Cattle Tubs use low-moisture, cooked molasses product technology. This allows consistent intake and nutrient delivery, which helps eliminate over-consumption and manage intake variability. And, it provides readily available energy to help stimulate rumen fermentation, which helps cattle extract more energy from forage. Tub supplementation can also help keep weight and body condition. This entry was posted on Thursday, April 12th, 2012 at 11:54 pm	and is filed under News. You can follow any responses to this entry through the RSS 2.0 feed. Both comments and pings are currently closed.